and how they impact weld quality and consistency. The manufacture of metal seals, pressure devices, sensors, and many other metal components require precision welding. The sealing, shaping, or joining technique must be extremely reliable because it is necessary to maintain the integrity of the product. The weld process must also be accomplished without interfering with the cosmetics or function of the product. There are many variables to consider in the welding process. The variety of materials is growing daily and thus the burden on welding personnel to stay current with technology becomes more essential. Moreover, it seems that the predominant expertise in welding is acquired at the workplace by trial and error rather than by training in educational institutions. Soldering and Brazing: An economical means of applying filler metal to join components both in low and high volume. Resistance Welding: This process applies large current flow to heat the components at the point of highest resistance-- at the weld joint. Electron Beam Welding: This is a fusion process performed in a vacuum chamber where a high velocity beam of electrons is focused on the surface to be welded. Laser Welding: This process uses focused coherent light (a laser) to melt the base material and is used for precision welding or production of quality parts. Gas Tungsten Arc Welding: Gas Tungsten Arc Welding (GTAW), also known as Tig (Tungsten Inert Gas) Welding, is the most commonly used precision arc welding process. A welding arc is established between a Tungsten electrode and the part to be welded. The metal of the part is melted by the intense heat of the arc and fuses together. Plasma Arc Welding: Plasma arc welding, basically an advancement of the GTAW process, uses a copper nozzle to surround the Tungsten electrode. A pilot arc is first established between the electrode and copper nozzle and then transferred to the part to be welded. Tig and Plasma weld processes are the most commonly used methods for precision joining. Weld quality and repeatability has improved in sync with advances in power supply, process controls, and welding techniques. 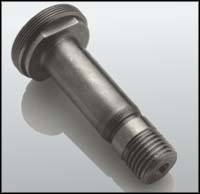 These advances allow the use of the process in even more precision applications. The electrode tip dimensions shown must be held to close tolerances and the surface finish (ground or polished) of the electrode grind must be consistent. The Tig and Plasma welding processes were originally developed to provide a means to produce acceptable weld quality on a variety of metal materials and alloys. Advances in power supplies, welding techniques, and process controls have allowed for greater weld accuracy and the process is now used in an even broader range of precision applications. In the Tig process an electric arc is established between a Tungsten electrode and the part to be welded. To start the arc, a high voltage is used to break down the insulating gas between the electrode and the workpiece. Current is then transferred through the electrode to create an electrode arc. The metal to be welded is melted by the intense heat of the arc and fuses together. The plasma weld process is a variant of Tig welding that has an additional copper housing around the electrode that directs and further constricts the arc. Both processes use a Tungsten electrode ground to a point both as the source of the arc ignition and the means of energy transfer. A variety of parts of all sizes can be joined with precision arc welding techniques. Note the pulsed arc finish on the weld surface. The pulsed arc wleding technique offers low heat input as it is used in welding thin components or metals next to fragile material such as glass or polymer. This is done by rapidly increasing and decreasing the arc welding current. This makes a seam weld of overlapping spot welds, which reduces the overall heat input to the area and also allows for increases in weld speed. This technique is used to great advantage by combination of rapid response power supplies and weld process controllers. The result is improved weld quality and increased output. Looking more closely at all the elements of the welding system will reduce or eliminate many of the reasons arc welding systems occasionally seem to develop a personality of their own. Power Supplies: The welding power supply itself has been refined. The method of delivering brute force power to a welding arc has become outdated as cutomers demand superior products. Higher performance machines with greater efficiency, accuracy, and response time have replaced these earlier "beasts." Welding Control Systems: In order to meet more rigorous quality demands, the welding industry has moved to a much stricter control of standards and has developed weld programmers-devices that store and execute weld programs. The welding process section of the work is automated by these programmers/ controllers and helps to reduce scrap parts by executing repeatable, pre-arranged weld programs within precise welding parameters. The welding capability is thus built into the welding system through the weld controller rather than taught to the manual welder. As a result, there is less opportunity for error or fatigue. These controllers are used by manufacturing organizations for medium to large contract runs. Lower costs are attained mainly by confining the necessary skill level of an operator to loading and unloading parts. While repetitive welding is now accepted as an operation to be automated, there will always be a need for the skilled welder and manufacturing organizations have found ways to improve output here, too. Orbital Welding Systems: Orbital welding systems were designed to be used in applications where a tube or pipe to be welded cannot easily be rotated or where the space restrictions for access limits the size of the welding device. In the orbital welding process, tubes/pipes are clamped in place and an orbital weldhead rotates an electrode around the part to make the required weld. Orbital welding systems are used for welding tubing in industries such as aerospace, boiler tubing, food and dairy, nuclear, pharmaceutical, and semiconductor. Tungsten Welding Electrode Tips: The Tungsten electrode, the source of the welding arc, is the element most commonly ignored by manufacturing organizations. Whether in manual or automatic welding, this is the area where manufacturing organizations can improve the consistency of their welding output with minor effort. The safety issues of Tungsten electrode material are also being looked at more closely now. Many users of the Tig or plasma welding process do not realize that the welding electrodes they use contain Thorium, a radioactive element added to the Tungsten material to improve arc starting and welding characteristics. While the radioactivity is of a low level it brings an issue of danger--especially with the radioactive dust generated when grinding the electrodes to a point for welding. New Tungsten materials are now available, such as Lanthanated electrodes which offer superior arc welding characteristics and are safer due to their lack of radioactivity. While these materials are now commercially available, they have been largely ignored until recently. 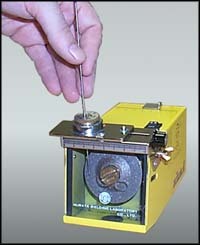 A typical tungsten electrode grinder. Pre-Ground Electrodes and Tungsten Electrode Grinders: Given the Thoriated electrode radioactivity issues and the ever-increasing weld quality requirements of the final weld, more and more companies are looking for ways to ensure that their weld quality is up to par. Consistency and repeatability are key to welding applications. The shape and quality of the tungsten electrode tip is finally being recognized as a vital process variable. Once a weld procedure has been established, it is important that consistent electrode material, tip geometry, and surface condition be used. Improved arc starting, increased arc stabblity, and more consistent weld penetration. A reduction of tungsten shedding minimizing the possibility of Tungsten inclusions in the weld. In arc welding processes a multitude of welding parameters exist that can affect the size, shape, and quality of the weld. Many weld parameters, or variables, exist and each can be discussed at length. It is imperative however, that the engineer responsible for welding have, at minimum, an understanding of how to choose and modify the basic parameters for simple weld applications. Listed below are the fundamental elements to understand. The physics of welding, arc starting, arc voltage, weld current, and heat input (watt-secs). Design of the weld joint, joint fit-up requirements, and heat balance considerations. Tooling design: materials and geometry. Rules of thumb for choosing the correct weld current. How to recognize insufficient or excess weld current. The six main benefits of arc pulsing. How to choose the pulsation rates empirically or from pre-calculation. The effect of weld speed. What happens when the weld speed is too fast or too slow? Arc length--how to choose the correct arc length. What happens when the arc length is too long or too short? Welding electrode--the effect of electrode material and geometry on the weld shape. Electrode materials available. Grinding requirements. Shield gases--how to choose the shield gas and gas purity grade. Gas tyypes and mixtures, argon, helium, argon/hydrogen. The effect of hydrogen on the arc and weld quality. Gas lens requirements.